The latest in our Clarkesworld anthology series will be published on April 1st. 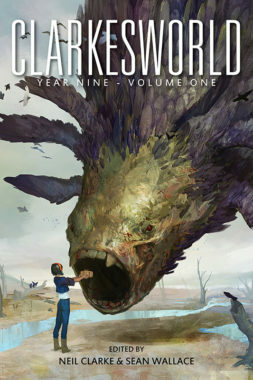 Clarkesworld Year Nine: Volume One, marks the first time one of our annuals has had to be split in two. Ebook editions are now available for preorder from Amazon, Apple, B&N, and Kobo. At the moment, the trade paperback is available in preorder from Wyrm Publishing. Amazon will have it available starting on the 1st. The second volume is already in production and I hope to have a release date for that soon. This set is long overdue, so you can expect the Year Ten anthologies to follow it fairly quickly.